The result of the recent ballot of shareholders was an overwhelming yes to apply again to the National Lottery Heritage Fund (NLHF) for a grant to help restore and rebuild the George Community Pub. Of the 72% return 204 shareholders voted in favour of reapplying with only 28 against. The George Committee have already submitted an expression of interest and are pressing ahead with architects, quantity surveyors and other professionals in preparation for a revised plan to closer meet the requirements laid down by NLHF. The submission of the new plan will be made in May of this year with the result known later in September. Stop press – since submitting the expression of interest to NLHF, we have now received the go ahead to reapply for a grant. The team are now fully engaged in preparing the application. As most of you will be aware The George Community Pub (Wickham Market) Ltd now own the Grade11 listed George Pub and to be able to restore the building have applied for first round funding from the Heritage Lottery Fund. Unfortunately, our first application failed which is not unusual. We have since met with our case officers in Cambridge who provided information on the reasons why and guidance on any future application should we wish to reapply. The George Committee are now working hard towards addressing the shortfalls of the application and when we have completed our work we will be sending the merits or otherwise of two options to our 325 shareholders. A members meeting will then be called and a vote taken on whether we should make a second updated application or to maximise the value of the site and sell it with the aim of returning shareholder investment. It is expected that this meeting will take place sometime in February. In September we received news from the Heritage Lottery Fund that our grant application for funding had been unsuccessful. We will now ask the shareholders to vote on whether we re-apply or not depending on further discussions with our case officers at the regional office of HLF in Cambridge. It may mean we will need to reposition our proposal, any options that are created will also need shareholder approval. A vote to proceed with a second application or not is likely to take place in late February 2019. In the meantime you can still buy shares if you wish to do so. Click on the button below to find out more about buying shares. You may have noticed that work to tidy up and make secure the site of the Grade 11 listed George Pub has begun. The George Community Pub (Wickham Market) Ltd and its 321 members are now the official owners and are actively seeking a conclusion to the long awaited work to restore the building. The group have already applied for a grant from the Heritage Lottery Fund and should know the result of their application sometime later in October. All being well the start of the development will be November 2018. The planning phase will take approximately 12 months with the second phase of restoration and construction estimated for completion in 2021. The site has been a blot on the Wickham Market landscape for over 5 years and the group’s aim is to return this important building back to its former use as a community pub whilst saving an important heritage asset for the benefit of the village. Management Committee initiates option to buy the George. 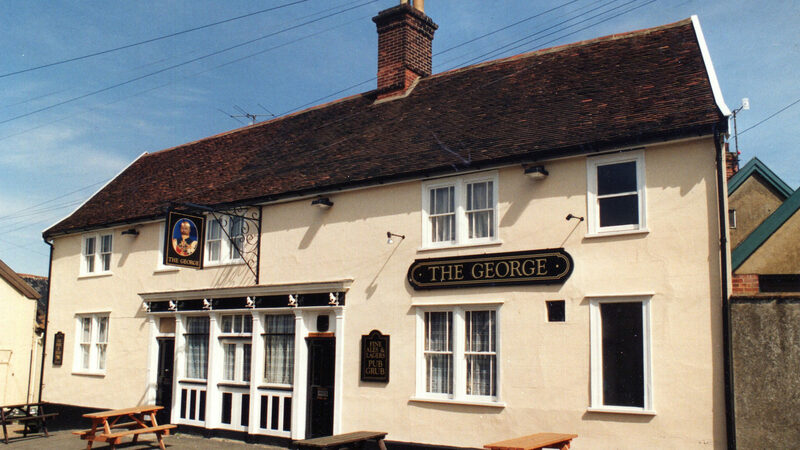 On the 30 July the George Management Committee initiated our option to buy the George Pub from the current owner. The date for completion has now been fixed as the 12th September ’18 when all shareholders (members) will become owners of the George and this exciting community project. The sale of shares is ongoing and if haven’t already invested and want to become part of the team you can download an application form by clicking here. Shortly following the purchase of the pub you will start to see some onsite changes as the tidy up process begins and safety hoardings are erected around the site perimeter. After putting up with the gradual deterioration of the building over the past five years this work will confirm our ownership and send a positive message to the Wickham Market community that things really are starting to happen with the site. It’s official – we’re on our way! The threshold of £100k which enables us to purchase the pub has now been reached and we are well on our way to achieve the £300k target. In ten weeks £120k has been raised from 277 investors, a wonderful result. This doesn’t mean that we have closed the share issue so if you would like to invest further, or take your first step into share ownership and participate in the project you will be most welcome. Ownership will provide the necessary support in our bid for Heritage Lottery funding and will be seen by other grant providers as a very positive action. The first visible sign you will see that the purchase is complete is replacement of the metal Heras boundary fencing with wooden hoarding. We will keep you posted with further information on progress. The Share Offer remains open but the decision to buy the pub or abandon the project must be made no later than 27th July. We are now less than £10k away from crossing the line and being able to proceed. For more information on current position see below. The current situation and decision on the future of the George is determined by the Funding strategy. You will see from the Share Offer Prospectus that the income for purchase, rebuild and associated costs is ‘largely derived from share income and grants’. The principal grant income is identified as an award by the Heritage Lottery Fund. We submitted an application for £998,000 to meet their deadline of 25th May and we have been informed the result will be known by the end of September. For the application to be eligible we need to own the pub and have commenced execution of the Option to Buy in July. Completion of the purchase will then take a maximum of 28 working days, but could be much less. The gap between the funds required and HLF grant will be met by Community Shares and other grants Potential other grants have been identified and are included in the HLF application. Regarding Community Shares we targeted £300,000 as this is typical for other Community Pubs. However in the Share Offer Prospectus you will see that we set a minimum of £100,000. On reaching that amount we will issue shares to all applicants and continue with the project including further share sales. The gap between what we raise in shares and the £300,000 is intended to be covered from other funding sources. On reaching £100,000 of share investment we will be eligible to apply to the Share Booster Fund for a matching share purchase which could, if successful, double that share investment. Because of the HLF grant application our decision day is 27th July and it can go one of two ways. If we have received monies for applications amounting to £100,000 or above we will proceed with the Option to Buy, and if the minimum hasn’t been met we will have to close down the project and the future of the site will be a matter for the owner and SCDC. In the latter situation all monies from share applicants will be returned to them. As of today (13th July) we have received 262 share applications and are now 90% there and within £10,000 of the minimum required to proceed. If you wish to invest or raise the level of your application to help take us over the line then please do so soon, 28th July is too late. For further information, including risk factors, please see the Share Offer Prospectus which can be found by clicking here. We are pleased to inform you that we are now over halfway to reaching our minimum share target of £100,000. Share applications are coming in steadily on a daily basis, but the deadline of 23rd June is fast approaching. We know that many more supporters are planning to invest but haven’t yet got round to it. PLEASE DO SO NOW. Our village survey indicated massive demand for a community pub in Wickham and many people have supported our meetings and events. We do not want to abandon the project through lack of financial support and so appeal for your help in getting us over the line. As soon as we reach the minimum share target we will buy the pub. If you have already applied for shares then very many thanks. 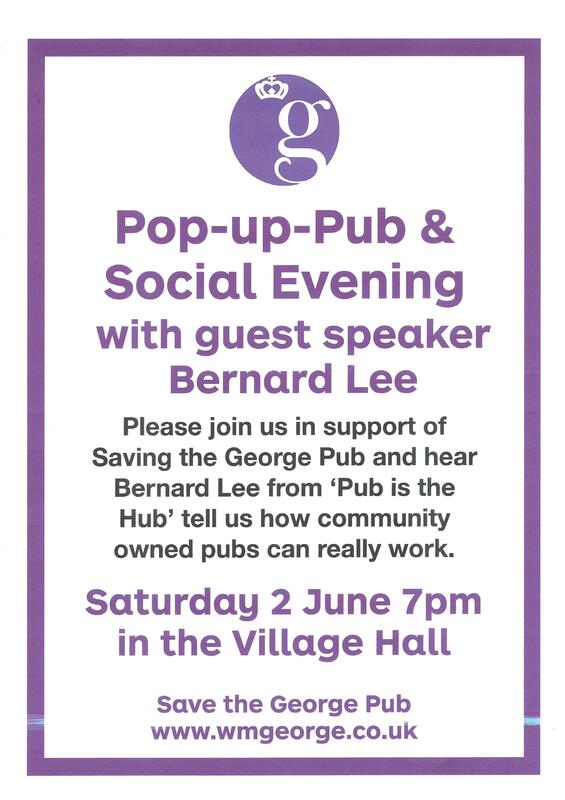 You will be able to visit the George as an owner, enjoy your drink in the bar, a meal in the restaurant, and enjoy our community room and know that you helped make it happen. Please share this vision with family and friends. The minimum target of £100,000 will enable us to buy the pub and move onto the next stage. The more we get above that, the easier our journey will be, so thank you for your support. Please see rhe EADT article about the share launch on 12th May which was a huge success. Great publicity for the project.